This is a progress report on two of my trial tomato varieties for 2011, Yellow Plum and Super Marzano, seeds of which I bought from Tomato Growers Supply Co.
For a generation I’ve been growing small yellow tomatoes—usually Yellow Pear or Yellow Plum—for the primary purpose of making a family heirloom recipe, Yellow Tomato Preserves. I’ve learned over the years to choose Yellow Plum if I have a choice, because the Yellow Plums a slightly larger and meatier than the Yellow Pears, which means less preparation and cooking time. This year I spotted Yellow Plum seeds in the Tomato Growers Supply catalog, and I have been delighted with the fruit. They are, on average, an inch and a quarter in diameter, meaty, about one ounce each, with little green in their cores (which tends to discolor the preserves over time), and somewhat more resistant to splitting after rain than the Yellow Pears I’ve grown in recent years. 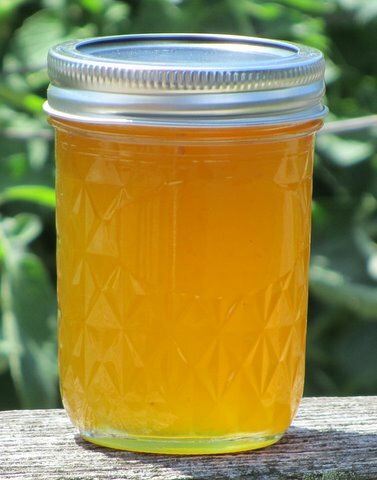 Monday afternoon and evening I made my annual batch of Yellow Tomato Preserves using a recipe very similar to the one my great-grandmother used. (For that story, see the link below to a posting I made last year. It includes a link to an online recipe.) That recipe calls for five pounds of tomatoes and five pounds of sugar, plus lemon (and I add pectin), and this week yielded eight eight-ounce jars and six four-ounce jars of preserves, plus a little left over for the preserve maker, of course, to enjoy on toast or English muffins the next few mornings. But Super Marzano has been a disappointment. I’ve picked scores of fruit off three plants, and only three or four have been 5-inches long. Almost every fruit has been stunted because of blossom-end rot, as the photo indicates. Yes, I added some pulverized lime and water, as I do when I plant all my tomato varieties. A Big Mama plant between two Super Marzano plants has no blossom-end rot, and neither do two rows of Brandywines in front of the Super Marzanos. Comments posted earlier this growing season indicate that many tomato-growers are having major blossom-end rot problems with their paste-type tomatoes. If you’re growing a variety that has been relatively rot free, please post a Comment and tell us what it is—and add any special tip you have to prevent the problem. 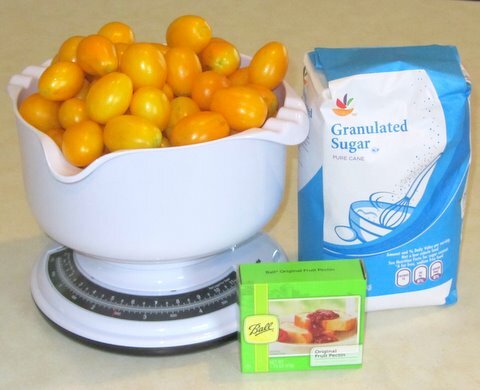 To read my posting of August 2010 about why and how I make Yellow Tomato Preserves, CLICK HERE. I planted Amish Paste and Roma tomatoes this year, and they've done great with little work. The Amish Paste likes lots of water. I'll be planting both varieties next year. Makes great sauce. I planted two Roma plants and have had no blossom end rot at all. All that I did at planting time was mix some compost into the planting hole. I mulched around these plants (and all my others) with grass clippings and straw. I didn't add any lime or eggshells. Thanks for the critique on Super Marzano. I was thinking of planting them next year, but maybe I'll just stick with Roma instead. I planted Nonna's Hybrid. They've done very well so far. Only a couple have had blossom rot, but hardly any compared with the variety I planted last year. I add worm castings to the hole when I plant and when they start to make flowers I pour some milk around them – either my goat's milk or some skim from the store. like rmgales, i have also had a great year with determinate Amish Paste roma plants, which i have been growing from my own seed for years (can't remember where i originally got them from). there have been only one or two fruits with BER out of several dozen; the BER happened during the dry weeks we had. i also grew speckled roman tomatoes, which fare much worse in terms of blights and BER, but these are the absolute best sliced into disks and baked on pizza, so i grow them every year despite their flaws. i splurged on a blight resistant miniature plum from Johnny's this year too, the name is just some hybrid number. the fruits are only slightly larger than cherries, but very good flavor, and are certainly blight resistant and have never shown BER. I'm growing Granadero from Johnny's Seeds in SE Ontario. 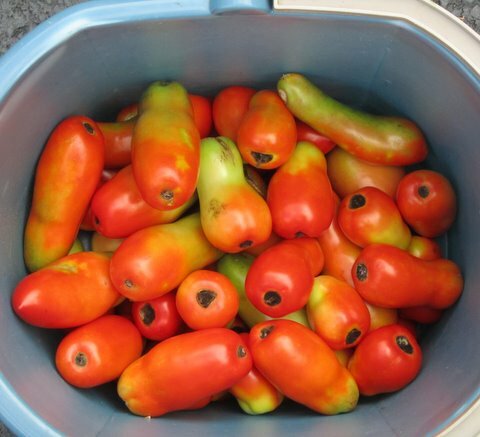 I have thrown away one tomato only so far – it was termed resistant to BER and, (knocking on wood), so far so good!